“Yum Cha” was a popular eating experience in Sydney, especially on a Sunday afternoon. This is small Chinese dishes, mainly steamed items like dim sums and pork buns, served in wooden containers. Traditionally this should be accompanied with drinking tea. 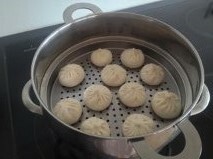 Having not found anywhere in Vorarlberg to continue our love for Yum Cha we attempted to make our own steamed dumplings at home. These turned out better than expected however were definitely not up to the standards we were used to, therefore when we found out about the asian market in Hard we planned a shopping trip straight away. Arriving on a Saturday morning the car park was already pretty full. Initially we just started to wander the isles however quickly realised that we were going to need a basket. 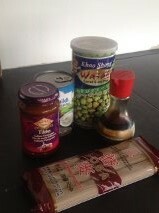 Before we even got to the dumplings we had stocked up on our favourite curry paste (which we had not found in Spar), buckwheat soba noodles, soy sauce, coconut milk, wasabi peas and some wonton wrappers which I used to make low calorie mini quiches. Finally we made it to the freezer section where we filled up on prawn and pork dumplings, which from the size of the packages would keep us going for a while. If you’re looking for some alternative finger foods for a party you are not short on choices here. It had also been previously highlighted to me that you can buy PG Tips tea here. If I was a true Brit I would be extremely excited ab out this discovery, but I actually don’t drink tea and so I can’t tell you if these are as good as the ones back home, but it’s always good to know where you can buy a cuppa that reminds you of home. You can also pick up fresh fruit and vegetables, asian beer, a whole range of other asian cooking staples and cooking utensils. So if you love cooking and can’t find what you’re looking for in Spar or Sutterlüty head out to Hard to stock up your cupboards.